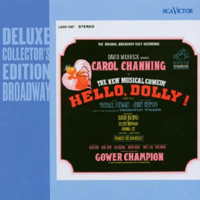 Original London Cast, 1965 (RCA/ArkivMusic) (4 / 5) The “Original London Cast Recording” label is accurate in the sense that this album does represent the cast of Hello, Dolly! as the show was first seen in London, but the company is actually that of the international touring production. The star of the show is Mary Martin, a true legend of the American musical theater. Martin apparently declined to have her music transposed to lower keys to accommodate the changes in her vocal range as she aged, so there are a few less-than-lovely high notes to be heard here. Still, the beloved performer is so charming in Dolly Levi’s songs that these limitations don’t seem to matter much. The supporting cast is of variable quality: Garrett Lewis doesn’t really have enough voice for Cornelius, but Loring Smith is fine as Vandergelder, and Marilyn Lovell is very appealing and sings fetchingly as Irene. — M.P. Broadway Cast, 1967 (RCA) (5 / 5) In order to rekindle interest in Hello, Dolly! three years into the show’s run, producer David Merrick brought in an all-black cast headed by two iconic performers, Pearl Bailey and Cab Calloway. The recording begins with a gorgeous, full-length overture that’s almost too symphonic for this basically bouncy show; like the “Prologue” of the original cast album, this overture was created specifically for this recording. Philip J. Lang’s revamped orchestrations are fabulous, and the performance of the title song is the best ever recorded: Bailey and the boys have the time of their lives as saxophones wail, trumpets blare, a banjo strums, and the xylophone player goes nuts. 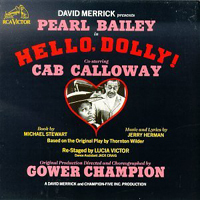 As Dolly, Bailey is a real pistol and very funny when required, but she’s just as strong when delivering the more emotionally weighty “Before the Parade Passes By.” Calloway makes the role of Horace Vandergelder his own, even if he’s only heard leading the male-ensemble number “It Takes a Woman” and in a reprise duet of “Hello, Dolly!” with Bailey. Jack Crowder’s rich baritone voice isn’t exactly right for the callow Cornelius, but Crowder sings so beautifully — especially in “It Only Takes a Moment,” one of Herman’s loveliest ballads — that it’s foolish to carp. He’s superbly partnered by Emily Yancy, who brings just enough jazz/pop style to Irene’s songs to make them seem fresh without distortion. 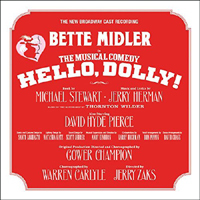 By a considerable margin, this is the finest recording of the Hello, Dolly! score. — M.P. 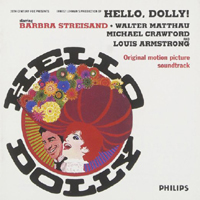 Film Soundtrack, 1969 (20th Century-Fox/Philips) (2 / 5) Barbra Streisand’s voice was at its zenith at the time of this recording, which may be enjoyed for the sheer pleasure of hearing her sing these songs, even if she does so in a style very different from the original conception of the score. Two of her best numbers are “So Long, Dearie,” heard here in a terrific way-up-tempo arrangement; and “Just Leave Everything to Me,” a new song that was written for the film to replace “I Put My Hand In” from the stage score. Streisand also sounds great in the title song and “Before the Parade Passes By,” although her ultra-slow delivery of the first sections of both songs will not be to everyone’s taste. Walter Matthau is no great shakes as a singer, but he does well enough in Horace Vandergelder’s one-and-a-half numbers, and is quite funny in the part. The greatest liability of the recording is Michael Crawford’s high, thin, cartoonish voice, extremely off-putting in “Put On Your Sunday Clothes,” “It Only Takes a Moment,” and Cornelius’ other songs. Whoever dubbed the singing for Marianne McAndrew as Irene Molloy sounds lovely if a bit bland. On a very positive note, it’s a gift to have the legendary Louis Armstrong on hand for one chorus of the title song as a memento of his hit recording from the time of the show’s opening on Broadway. The arrangements and conducting, by the well-respected Lennie Hayton and Lionel Newman, are fine for the most part. But given Streisand’s odd casting and Crawford’s extremely weird sound, this recording is far from definitive. — M.P. Touring/Broadway Cast, 1994 (Varèse Sarabande) (1 / 5) Here’s an unfortunate cast album of a mid-’90s touring production that eventually got to Broadway. 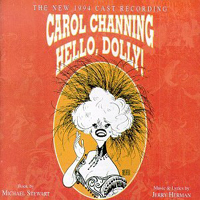 It was recorded when star Carol Channing was over 70, and she sounds even older here; this reviewer heard better singing from her several years later, so she must have been tired and/or under the weather for the recording sessions. Jay Garner is lots of fun as Vandergelder, and Michael DeVries, with his ringing tenor, is happily cast as Cornelius, but the uncontrolled belting of Florence Lacey is all wrong for Irene’s songs. The orchestra sounds relatively small and is not well recorded, with the percussion far too prominent. Skip it. — M.P. Broadway Cast, 2017 (Masterworks Broadway) (3 / 5) This recording does only a fair job of capturing what was so special about one of the biggest hit musical revivals in Broadway history. Bette Midler brings her sparkling comic personality and unique vocal inflections to the role of Dolly Gallagher Levi, but it must be said that the voice itself isn’t in great shape on this recording, and whenever Midler is required to sustain a note for more than a beat or two, the sound is not pretty. (Hear, for example, “Before the Parade Passes By.”) Two other drawbacks of the album are that Andy Einhorn conducts certain sections of the score just enough under tempo to lower the excitement level, and while the chorus sings with heart and gusto throughout, they’re recorded in an acoustic that sounds slightly recessed. On the plus side, David Hyde Pierce is a delightful Horace Vandergelder; he makes a meal of the restored song “Penny in My Pocket,” further scoring with “It Takes a Woman” and his sweet rendition of half a chorus of “Hello, Dolly!” for the finale. Gavin Creel sings so beautifully and persuasively that he swipes the “Best Cornelius on Records” award from Michael DeVries. Kate Baldwin, also blessed with a gorgeous voice, does a far better job of mixing chest and head tones than Florence Lacey did in Irene Molloy’s songs. The new orchestrations by Larry Hochman are fine if by no means an improvement on the originals by Philip J. Lang, and the new overture is merely adequate. While Steven Suskin’s notes in the CD booklet are highly entertaining and filled with fascinating facts about the history of Hello, Dolly! 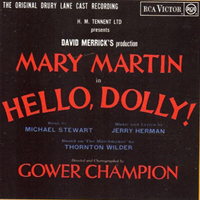 from the show’s genesis through this revival, Suskin avoids discussion of how much of the score was written by people other than Jerry Herman while the show was being doctored out of town prior to its Broadway opening, nor does he mention that Herman settled out of court a claim that the first part of the melody of the title song was borrowed from an old ditty called “Sunflower.” Perhaps Suskin was instructed not to include these bits of info, but they seem odd omissions in an otherwise impressively thorough essay. — M.P.